The information available on the internet about heart health may sound appealing, but the problem is that most of it is misleading and wrong. Relying on this false information can cause serious damage to your heart and hence it is important to separate myths from facts. 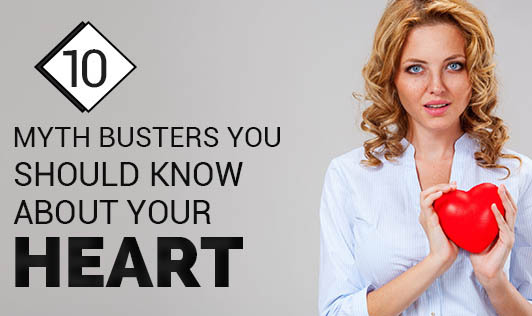 Here are top 10 myths regarding heart health that need to be trashed. #Myth 1- I am too young to get heart diseases. Plaque formation starts as early as your childhood and poor lifestyle practices early in life, will increase your risk to develop heart diseases even at young and middle age. #Myth 2- I will have signs and symptoms of high blood pressure. High blood pressure is a silent killer. You will never experience any specific symptoms of high blood pressure. The only way to know if your blood pressure is high is by doing a simple blood pressure test. #Myth 3- I will know that I am experiencing a heart attack because I will have chest pain. Although chest pain is a common symptom, you will not always have chest pain during a heart attack. Heart attacks may also cause subtle symptoms like nausea, shortness of breath, radiating pain from chest to arms, lightheadedness and pain in neck or jaw. #Myth 4- I can eat anything as I take cholesterol lowering drugs. Cholesterol lowering drugs reduce the cholesterol made by the liver, but if you continue to eat high cholesterol and high saturated fat foods along with it, the drugs will be less effective and your cholesterol levels in the blood will increase instead of decreasing. #Myth 5- Diabetes will not cause a heart disease, if I take diabetes medications. Keeping diabetes in control will reduce or delay your risk to heart disease, but you are still at a risk to heart disease as the risk factors for diabetes and cardiovascular disease are the same. #Myth 6- Quitting smoking will not reduce my risk to heart disease as I have been smoking for years. No matter how old you are, how long you have been smoking or how many cigarettes you have smoked; you will reduce your risk to heart diseases as soon as you quit smoking. According to a study, quitting smoking for a year reduces your risk by 50% in 10 years. #Myth 7- Pain in the legs is a sign of ageing and not heart disease. Although ageing can cause pain in the legs, it doesn't have to be the only reason. Pain in the legs can also be a sign of peripheral artery disease (PAD). PAD is a disease caused by a buildup of plaque in the arteries of the legs. The risk of heart disease or stroke is 5 times more in people with PAD. #Myth 8- Heart patients should eat less fat. While saturated fat, hydrogenated fat and trans-fats are bad for your heart and should be avoided, unsaturated fats like MUFA and omega3 present in nuts and fatty fish protects your heart and is good for you. #Myth 9- One should not exercise after a heart attack. False, in-fact people are encouraged to join a cardiac rehabilitation center in 2 weeks after an attack. According to studies, the right kind of exercise reduces the progression of heart disease and also prevents re-occurrence of a heart attack. #Myth 10- Angioplasty or Bypass will cure my heart disease. Angioplasty or bypass surgery relieves your chest pain and improves your quality of life, but they do not stop atherosclerosis you need to correct your lifestyle, high blood pressure and high cholesterol to prevent atherosclerosis and heart disease.